Denver Real Estate and Relocation - Kristal Kraft...Selling Denver and the 'Burbs! Most people receive all sorts of advice from friends and family when they decide to purchase a home. The amount of information available on the web is astounding! I've been selling real estate for many years now. I field questions from buyers and observe common mistakes quite frequently. Typically I try to educate my clients on the things they should be concerned with, particularly when it comes to buying a property they may regret. Your Exit Strategy. You may be in the buying mode right now, but one day you will be in the selling mode. Make sure what you are buying will sell. By that I mean if you are in a family neighborhood where all the homes have 4+ bedrooms, don't be a maverick and buy a 2-bedroom house. Well don't do so unless you can live with the idea it will take longer to sell or don't fool yourself! How long do you plan to stay? Recently I sold a home where the owners made over a 50% profit in less than 2 years. This is an exception to the rule, certainly not the norm. The real estate market goes up and down. Generally if you have a secure job and plan to stay in the house 3 years or longer you should be fine. If your job is iffy and you're in a field that might require a relocation, I'd advise to buy with caution. You can buy, but be prepared that leaving might cost you. Buy with your head and not your heart. Buying a home in an emotional process. Sometimes buyers "fall in love" with a home that is priced well above their means. Yes, there maybe a way to get the sale done, but will you be happy if you have to forego furnishing the home and eating beans for a decade or two? Review the neighborhood demographics. Once when my kids were little we bought a home in a neighborhood where there were NO kids. None. Nada. Lucky for us after a few months the empty nesters started selling their homes and the neighborhood started turning over. So if you want playmates for your tykes, cruise the neighborhood for clues; swing sets, basketball hoops and bikes are good signs. Conversely if you are a young single looking for a neighborhood of the same, you can cruise with a different intend. Or ask me for the demographics of the area. I have access to all that! Look beyond the staging. When a homeowner moves out, so does all that pretty furniture and art work. You get plain vanilla. Visualize the home without the decor. Does the house still work for you? Consider ALL the costs. The house payment consists of Principle, Interest, Taxes and Insurance. You will also have utilities and maybe HOA fees. Additionally you need to plan to budget for those other expenses, exterior maintenance like paint, roof, windows, landscaping, fencing which might need repair or replacing. It happens to every house. If you don't keep it up it will deteriorate and your home value will go down. Homes where these things have just been replaced should be recognized for the value they bring to the table. Today we see so many Fix 'n Flip where all they have done is put a pretty dress on the house and ignore the expensive (to replace) components that aren't as romantic. It is called putting "lipstick on a pig." Cost of Exterior Maintenance. Some homes are easier to maintain than others. For example, a brick home will only need to have the trim painted where a frame home will need painting/stain all over. The difference in that can mean thousands of dollars. So yes, you will pay a little more for a brick home but over time you will gain that back plus some. In Colorado we see many 40-year tile roofs which are a better value than a regular asphalt roof. Once again there's value that's not exciting, until you consider the savings. Cost of a new home vs resale. Many people turn their noses up at resale homes because they prefer a new home. That's fine, just remember few new homes are completely finished. Oh I so learned that once when I had to dig deeper into my checkbook to pay for window coverings, sprinklers/landscaping and fencing! After that I looked at resales with a new appreciation! View, view, view! Colorado is known for its views, some are permanent and some are temporary. Just because a home has a view today doesn't mean it will be there tomorrow. No the mountains aren't sinking but subdivisions are growing and open space unless it's "dedicated open space" may have a bunch of big old house blocking that million dollar view next year! Open your mind! If you are looking for a deal don't pass over those homes with crappy pictures. Because the photos are crappy means the agent is a crappy photographer and the home may (or may not) be awesome. I can't tell you how many deals I've found for my clients where the agent didn't take the time to post good images of the house. It's a disservice we LOVE to find! Please note, this simple list is not complete! A real estate purchase brings with it many individual needs. If you want to discuss your goals and how to properly align them, call/text/email me! I look forward to hearing from you. Desirable Penthouse unit with vaulted ceilings, south-facing complex greenbelt offers peaceful view and lots of sunlight. Second bedroom is used as study, washer/dryer in unit, updated bathroom and kitchen w/pantry, lives LARGE! Pet friendly complex with its own dog park! Conveniently close to Cherry Creek Bike Trail, Infinity Park Complex, restaurants and shopping. SHOWINGS BEGIN SATURDAY, FEBRUARY 18. FHA Lowers MIP Saves Borrowers Money! Homeowners thinking of using FHA for financing their next home will be happy to learn the mortgage insurance premium will be decreased by .25% starting on January 27, 2017. The Federal Housing Administration (FHA) said this reduction will allow more "responsible borrowers" to purchase a home. On average the savings will be $500/annually for borrowers. FHA Mortgage payments consist of interest, principal and MIP. Mortgage Insurance Premiums are used to insure the lender against the borrower's default. FHA allows borrowers to finance a home with as little as 3.5% down payments. Since the borrower doesn't have a lot of "skin in the game" the lender off-balances that with mortgage insurance. 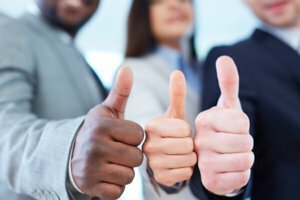 While lowering the MIP payment is a good thing, interest rates are rising so the effect might not stimulate many new buyers as the savings will be a wash.
As with any financing, the best advice I can give is to work with a good lender, one who is consultative and will provide you with options to fit your situation. Should I Wait Until Next Year or Buy Now? It is not news that the Denver real estate market is on fire! Everyday I speak with potential buyers who are wanting to become homeowners. Sadly they are finding that each month they can afford less and less of a home, because prices are going up at a steady pace. Some homebuyers are giving up, but others recognize the importance of hanging in there. This infographic tells the story of why! 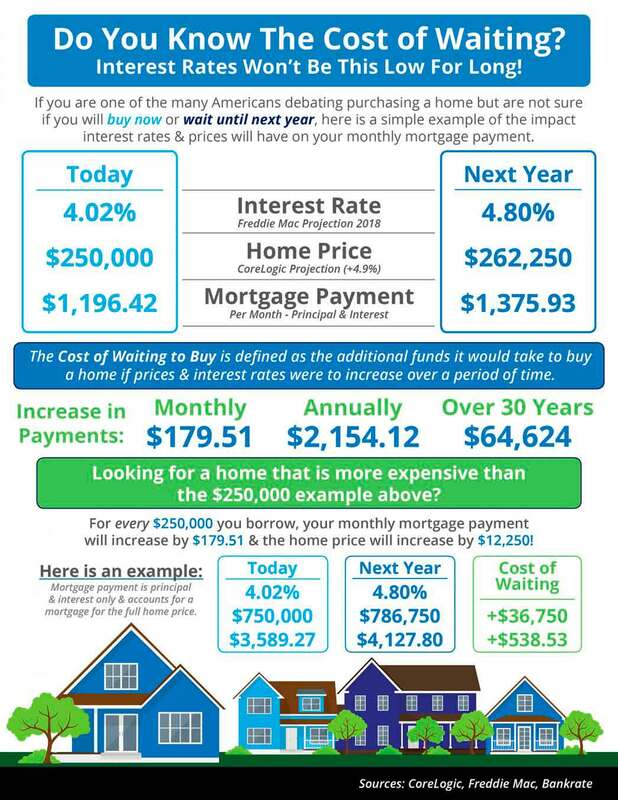 Waiting to purchase means becoming a homeowner will cost you more. 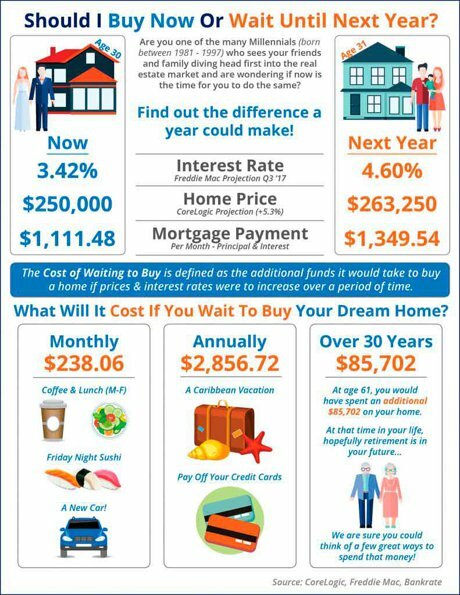 If you are a homebuyer wanting to find your home, please call me. Me and my team will assist you until we get the job done! First time home buyers may often feel they are alone in the Denver real estate market. But the reality is they aren’t! 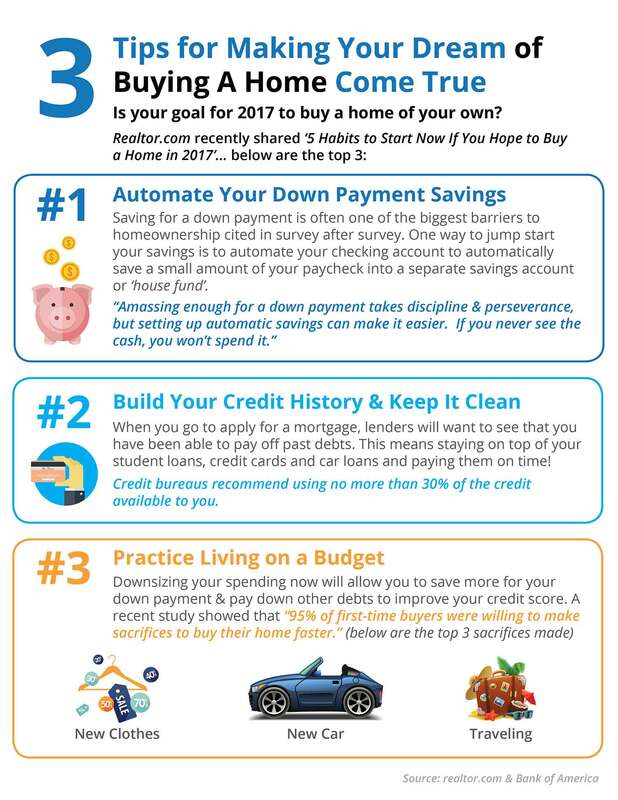 Buying a home has become easier for those first time buyers. 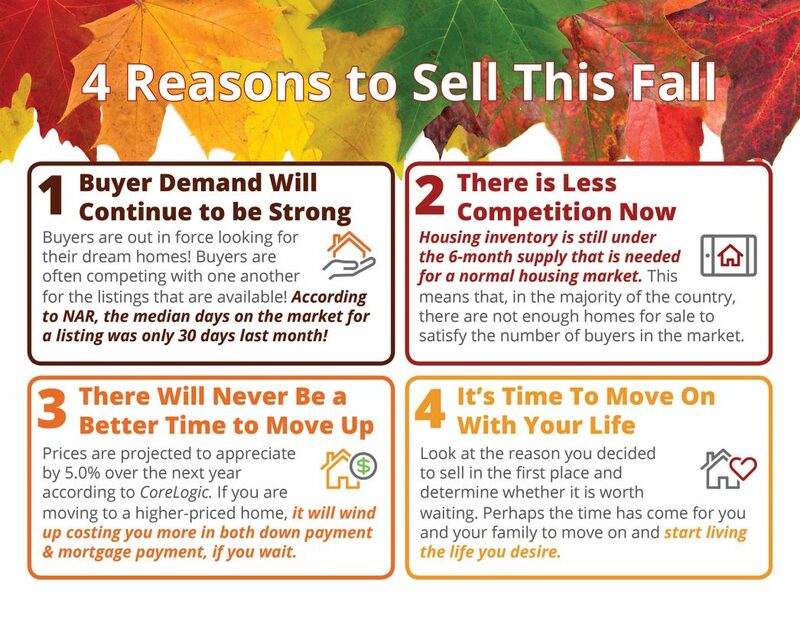 Lower down payments, down payment assistance programs, 100% gifting allowed from parents, historically low interest rates and lots of employment opportunities in Metro Denver are all reasons making it easier for first time buyers to buy a home. So if you are a first time buyer don’t give up. Research the best methods for obtaining your home and give me a call. I’m happy to assist you! The Closing Process - How Long Should it Take?